Thank you to Stephen B of Scotland aka stephenbuchan@Flickr for another couple photographs shared with BPotD (original 1 | original 2 | BPotD Flickr Pool). As always, it is very much appreciated, Stephen. Bracken fern can be found throughout most of the world. The advantage of featuring one of the most widely distributed vascular plants is that there is a wealth of information online. On its classification: Is it one species with many subordinate taxa (i.e., subspecies and varieties)? Or is there now enough evidence to break up the one species into ten or so distinct species? The Flora of North America’s entry on Pteridium aquilinum notes the “disagreement existing among taxonomists” with a summary of evidence pointing to splitting up the one species into multiples, but still opts for a single-species approach. This illustration from the Flora of North America shows the variability of form between taxa. On edibility: The Plants for a Future database, as always, details the edibility and other economic uses, but accompanies it with a warning about potential health risks of ingestion. The Nova Scotia Museum simply labels it carcinogenic, with the suggestion that it is to be avoided. Wikipedia summarizes how bracken is used (and eaten) by several cultures. why Bracken hadn’t taken over the world” and related finding it on a caldera floor in the Galapagos where it almost never rains and the temps are in the 100s F.
On edibility, we here at Wisdom of the Herbs School have come down strongly on the “only as a (very) occasional treat” side, and only steamed, not raw. I cannot cite a source right now, but the clincher was receiving info that a toxin in Bracken bioacumulates. Boy, when I saw today’s offering it took me right back to my childhood. We (my friends and I) used to pull them up by the roots, and strip off the foliage, and throw them like spears. Somehow we knew to not throw them at each other. Never ran out of a good supply. Thanks for the memories, as Bob Hope used to say. 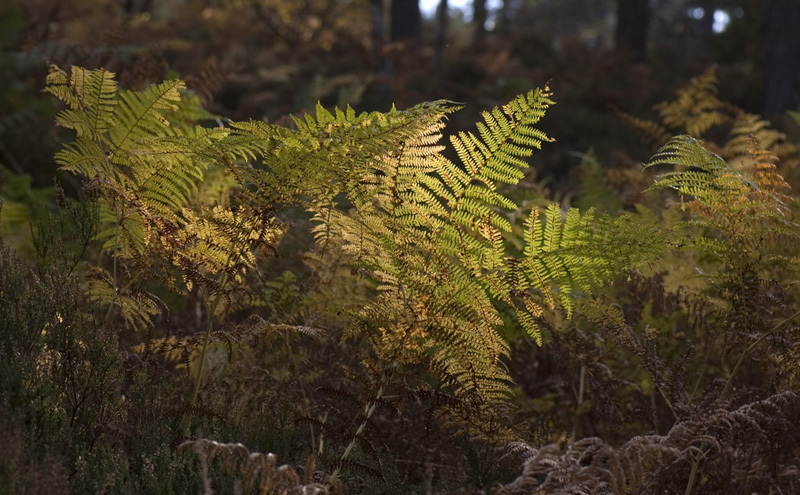 The backlit bracken takes me back to when I was a child. I used to walk through the woods in the arly morning or late afternoon. The forest floor was solid ferns, all backlit. It was a fantasy like environment. Sweet memories! Back in 1964 I completed my PhD using bracken fern as an indicator of site productivity for several tyree species at the University of Michigan. I am delighted that the plant again receives some attention. It is certainly a plant with personality and its indicator value for site productivity needs further work. The species has two subspecies, judging by what I knew back in 1964 ande no local rases were segregated out. As I travel the world I see it everywhere. It is like meeting an old friend again and again. It makes me feel at home everywhere. Thank you for the pictures and notes. 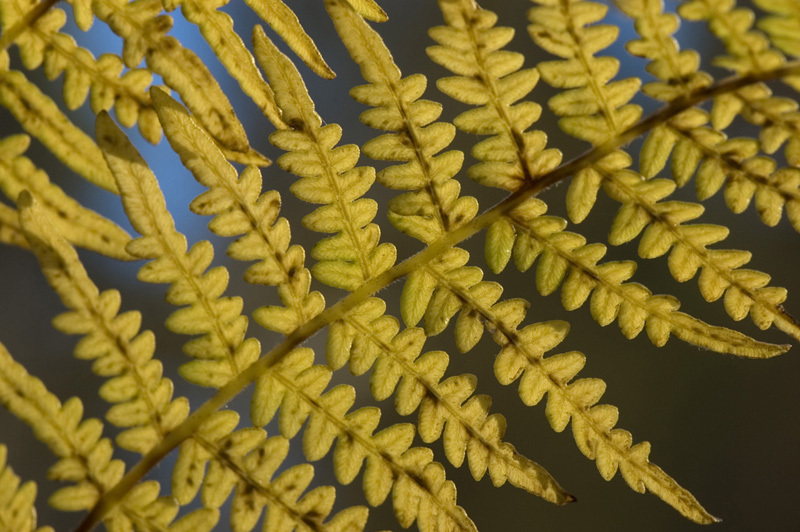 It is so to see these Fern Photographs. The forest floor is so nice with them. It is like a beautiful blanket. Pteridium aquilinum, composed of several subspecies, has a very wide distribution but is not cosmopolitan. North American bracken is essentially referable to the variable subspecies latiusculum. The genus also contains other species, each with a distribution of its own. Several research groups work with the taxonomy of the genus. Professor John A. Thomson from National Herbarium of NSW and the Royal Botanic Gardens (Sydney, Australia) is the world authority. He works with morphometry, nuclear genome, and chloroplast genome. Please review article about evolotion stem of dicotyledons. Leave a Reply to Harri Harmaja Click here to cancel reply.